Cats and Jammers Studio: Love those animals! 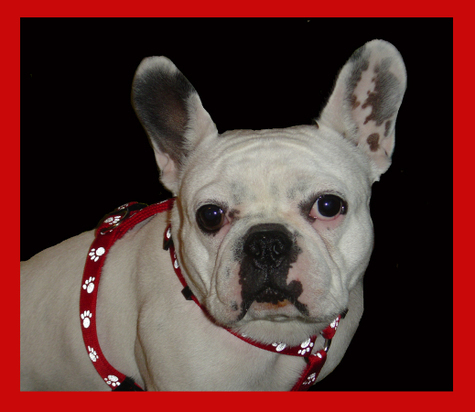 We have a French bull dog that I adore. How we came to have her was like this: my son had a friend who's family had her. The family had four kids and two dogs. She was one creature too many. Of course it didn't help her case that she is quite neurotic, was not getting house trained, and was hyperactive. Just suffice it to say, she had come to occupy the bottom rung on that family ladder. My husband and I had had a dog and cat for 17 and 16 years respectively. When they both died the same year we had our second son, we knew it would be a while before we had more animals in the house. And eventually with three boys and a host of other responsibilities, including actively participating in the sandwich generation thing, with all its pros and woes, the idea of responsibility for even one more living thing, including a houseplant, was not too appealing. But as the kids got older and life was settling down somewhat, I began to think about getting a dog from the animal shelter. The Newman boys had seriously been asking for pets for a while. And now that I was thinking about it again (just I, not my husband), I knew two things: the dog would have to be a non-shedder (our former beagle mutt shed copious amounts 12 months a year) and we couldn't get a cat because of allergies. Previously mentioned family had decided that “Bitty” had to go. I happened to learn this one night when I asked about “that bull dog, with the cutest face I have ever seen." "She's at the kennel for the weekend and we are getting rid of her," they said. Light bulbs went off. Fireworks exploded. Stars glittered brightly in the sky. And my husband stood in their kitchen and said, "NO DOG!" Two days later she was ours. And that was about 5 years ago. She is a genuine member of the family. I have written a picture book about her. I paint her into my illustrations. She even graces the logo of one of my blogs. Sometimes she is persona non grata with my husband. Well, actually, most of the time, because he thinks she is dumber than dirt. I say, “She is, but she is smarter than Paris Hilton." One night he said to me, "Why can't we have a normal dog like other people have?" My answer was, "Well we have challenging kids, and we have challenging pets. It's our destiny." So Bitty is here to stay. The boys love her and she is my constant companion. I guess I did not realize just how much I missed having a dog around the house until she arrived. She is extremely attached to me, and I to her, and SHE NEVER TALKS BACK OR USES SWEAR WORDS! Except for last night. No, she didn't swear or talk back. But--my sweetie pie, attached-at-the-hip doggie came to the back door....with a baby rabbit in her mouth! I think she caught it in my yard. That rabbit was deader than Jimmy Hoffa. Oh,yuck! My baby is a hunter of wild animals! My sleep-at-the-foot-of-my-bed, cuddle up pooch now has icky rabbit germs. All sorts of awful things came to mind. I confess: I made her sleep in her crate. Still, I love that dog. EDITED TO ADD: BUNNY UPDATE! I discovered where the den of rabbits was located, and also discovered three live baby rabbits nearby. They were "relocated" to a wooded area not far from my house, where they may have a better chance of survival than here in my yard, where my ferocious French Bull Dog will think of them as prey. I do have to add that my ever witty husband said: Well, what do you expect? Of course, she likes to eat Rabbit. She is French!!!! !